The product can automatically manage the working of solar panel and battery in solar system. 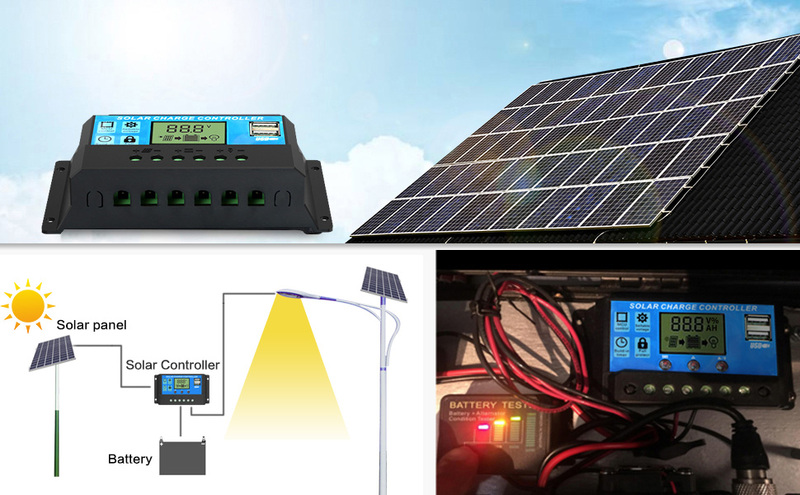 It is easy to set up and operate.For protecting the lifespan of your battery, once the voltage of the battery drop below 8V, the solar controller will turn off automatically (LCD will be unavaiable at the same time). <1>Please keep it in cool and well ventilated place to maintain good heat dissipation. <2>the regulator is only suitable for lead acid batteries:OPEN, AGM, GEL, not for nickel hydride, lithium, ions, or other batteries. <4>Indoor use only: the working temperature of this controller is -35°C to +60°C, during hot sunny days, the temperature outside might go up to 60-75°C. Please do keep the controller stay in cool and well-ventilated place to maintain good heat dissipation. <5>When the battery voltage is too low, the controller will stop to output(≦ 8V, controller turn off itself, LCD is blank,≦ 10.7V, 12Voutput ports are not available); after the solar panels charging, the battery will return to 12.6 V. It is a natural to output. (1)Automatically manage the working of solar panel and battery in solar system. (2)Overloading and short-circuit protection. (3)Build-in short-circuit protection, open-circuit protection, reverse protection, over-load protection. (4)Protection from lightning strike. (5)Prolong the battery life cycle and keep the load work well. (6)Easy to set up and operate. (7)Suitable for small solar energy system.